Surprise! I found some items that I wanted to share with the fans of Katie's Craft Corner over on Facebook and decided not to wait until December to do our first giveaway! Now, don't get too excited by the picture over there to the left. That isn't exactly what the winner will be getting. 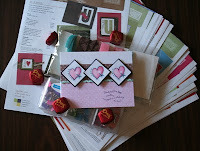 However, it does show a sample of the Inspiration Sheets that will be part of this prize. What will the winner receive? Well, let me tell you! Set of at least 10 Inspiration Sheets to fuel your inner crafter! Small package of chocolates to give you the fuel to craft! 1-2 handmade cards to either keep for inspiration or to send out to friends/family! Entry to the giveaway is nice and easy. All you have to do is make sure that you've "liked" my Facebook page and then come over here and leave a comment letting me know that you've done it and what your name is there. All entrants will be verified and then a winner will be chosen using random.org. This giveaway will close on November 19th at 10pm est. Good luck, everyone and make sure you keep sending everyone you know to the Facebook page. I'll be doing 2 more giveaways if we can get to 200 fans by December 1st! Would like to be entered! I would love to win something. I love to read your blog. I like you and like you some more!!! hey! I am going to try a giveway on my blog sometime also! You will have to let me know how it works for you! I'm so proud of you!!! I want to be entered to win! I'm a fan on Facebook! :) My name is "Christina Gomez"
Enter me please....I just love crafts and giveaways!!!! !